The STI team has been testing the new 2013 Subaru BRZ GT300 in Japan for the past two month’s and was ready to go. 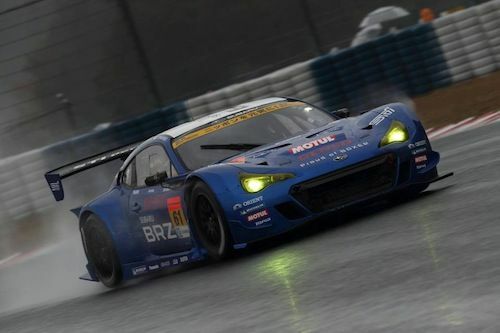 The new race car looks very similar to last years variant, but the 2013 BRZ GT300 that entered this first race of the series came with new specifications and with many new modifications. The STI team under the supervision of Hideharu Tatsumi, General Manager of STI Motorsport, was ready for the race. What happened on race day to through a wrench into their plans? The new modifications included improved chassis rigidity and a change in the engine mounting position. One of the biggest changes however, included the introduction of new Michelin tires. The team tested the tires last month at the Okayama International Circuit in Japan. On the first morning, the Subaru team was able to confirm the performance of the newly adopted Michelin tires. The car finished the test with flying colors and returned to the garage in perfect condition. The team was confident in the tires were ready for race day. But what happened to change things on race day? Last weekend, the weather was cold and cloudy after the rain on the previous day. In front of 16,000 spectators, the Subaru BRZ GT300 started the race from pole position, but could only muster a fifth place finish. Although the track was dry, the final race started under harsh conditions. After a low-pressure system had passed, temperatures fell to below 10°C due to a strong northerly wind. So the both the air temperature and track surface were lower than those during the official test in March. Tires play a critical role in performance, and the team struggled to keep traction on the cool track. Right from the start of the race, team driver Tetsuya Yamano struggled with the cold snap because it took so long for the new tires to warm up. He lost a position to 2nd on the opening lap and later slipped to 4th. When he came back to the pit to hand the car over to Kota Sasaki on Lap 37, he had moved all the way down to 10th place. Taking charge in the second half of the race, Sasaki claimed some positions back and finished the race in 5th place. But even with the fifth place finish, the team was encouraged and actually excited about their performance. Yamano said, “It was also valuable to be able to record comparable times with the top cars when there was grip in the first half of the race. I could say that we got off to a good start because we were able to identify what needs to be done”. Next, the STI team along with the new 2013 Subaru BRZ GT300 will head to Fuji Speedway on April 28 for round 2 of the race series. We’ll see if the weather and tires are a key factor.